With Christmas party season in full swing, the competition for best-dressed dinner table is on. 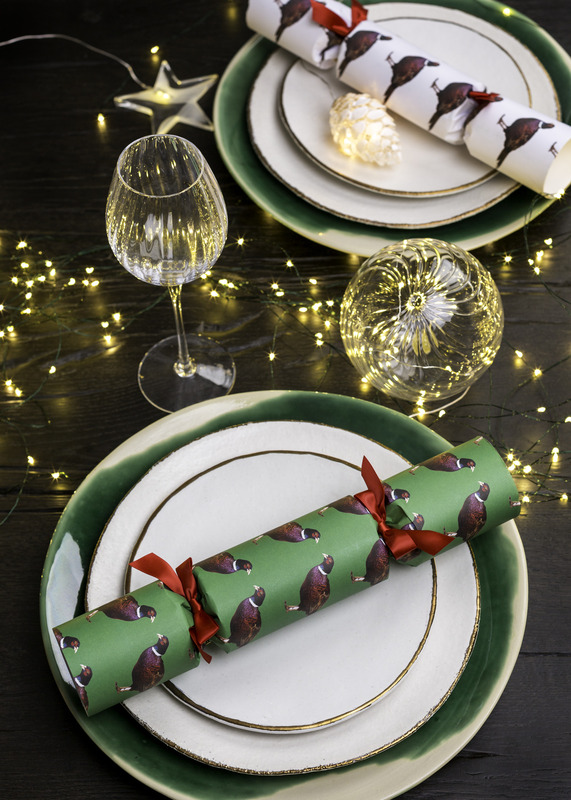 We’ve put together three Christmas table settings to help you gather ideas and inspiration for this year’s festive feast. 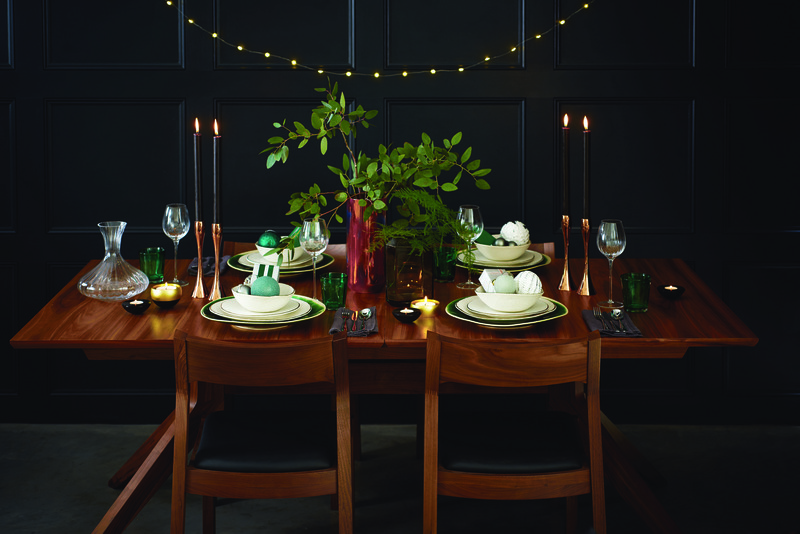 Our first look focuses on a traditional Christmas colour – green – but with a modern update. We chose a mixture of dinnerware from Mervyn Gers to set the scene and layered in fairy lights and illuminating decorations to create a cosy atmosphere. The Green Glaze dinnerware is only partially glazed with a glossy, forest green whilst the rest is left as exposed stoneware. We then paired it with the simpler Natural Bronze collection. With a subtle nod to this year’s metallic trend, the plates feature a subtle bronze edging that adds a touch of luxury. Characterful crackers from Nancy and Betty’s Studio add a fun finishing touch. 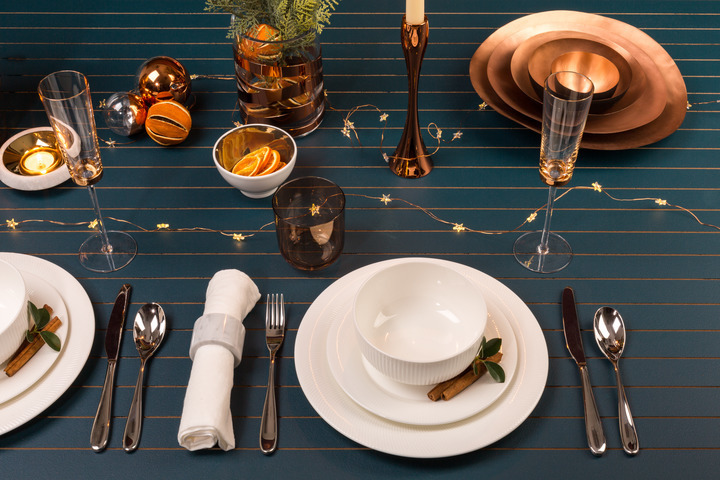 Metallics needn’t feel cold and austere like the winter weather as this contemporary Christmas table setting shows. Whether it’s a candlestick or the finish on a glass, the warmth of copper and rose gold looks beautiful in a low-lit dining room. Dim the chandelier, light some candles and lay out some fairy lights to get the desired effect – a midnight blue tablecloth will help further accentuate the metallic lustres. We wanted the copper accessories to really pop so opted for timeless white dinnerware that can be used all year long. 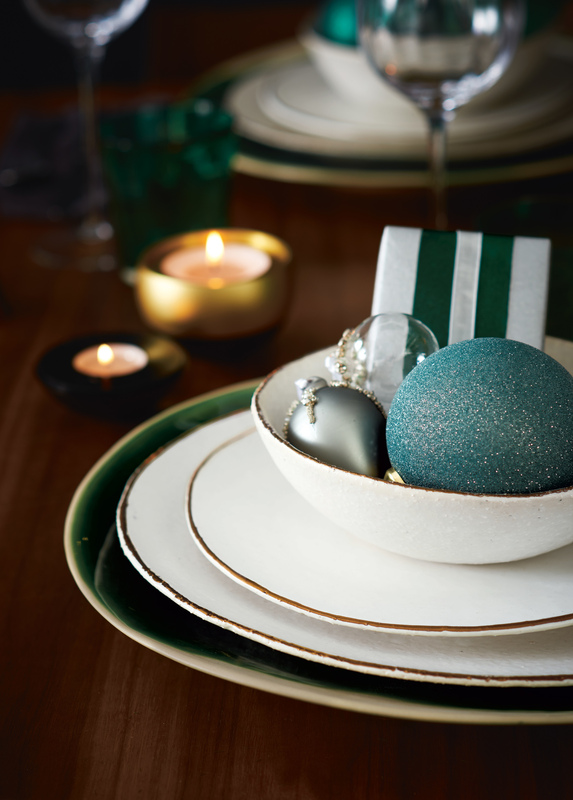 This elegant Christmas table setting is all about subtle finishes and embellishments. A minimal palette of white and grey abounds with marble and polished metal accessories providing accents to the table – not to mention a scattering of glass baubles from The Original Winters Tale for good measure. The concrete finish of the candleholders and Cooks tabletop provide a textural contrast to clean bone china tableware while the pearlescent finish of LSA glassware adds that extra bit of sparkle.